Verbatim shows off the Store 'n' Go Ultra Slim, a new portable USB 3.0 hard disk with a thickness of just 10.5mm. The new model is 20 percent thinner than its predecessors, it uses a 7mm internal HDD with a storage capacity of 500GB. The disk is available in black and silver, it comes with Nero BackItUp Essentials software and offers encrypted backup functionality. To save power, Verbatim equipped the disk with Green Button software, enabling the user to save power by configuring when the disk should enter sleep mode. Verbatim's Green Button energy-saving software reduces energy consumption and extends the drive’s life expectancy by automatically placing the drive into sleep mode whenever the user chooses this to happen. There are 3 'Sleep Setting' options. Set the suspend mode to come in after 10 minutes of use, or by increments of 10 minutes up to 120 minutes. Set the drive to suspend immediately by double clicking the Green Button icon on the desktop, alternatively you can set the drive to 'Never suspend the disk'. 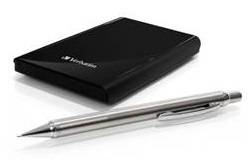 The Verbatim Store ‘n’ Go Ultra Slim HDD is also ideal for USB Recording. Many TVs nowadays are equipped with one or more USB port(s). We have already grown accustomed to playing back photos and movies from a USB hard drive or a USB stick on the TV. Now an additional USB feature has been added to TV sets – USB Recording. If you have recently bought a new TV there is good chance that it will support USB Recording, in particular when you have bought a mid range or high end TV. USB Recording enables you to record programmes to an external storage device directly connected to your TV via USB. Your external HDD basically acts as a video recorder. You can also use it to pause live TV. With USB Recording, your external USB hard drive becomes the replacement of your HDD/DVD recorder or even your VHS video recorders. The Verbatim Store 'n' Go Ultra Slim will ship later this month for 69EUR.